John and Stephanie Lowell have owned East Dennis Oyster Farm™ in the cool clear waters of Cape Cod Bay since 2003. Today they each own an acre and are licensed to wholesale, retail and cater (raw bar) their product. 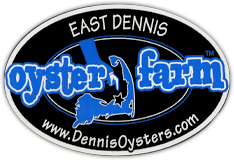 East Dennis Oysters™ now compete with Wellfleet Oysters as the most sought after product on the market. Visit our store by Appointment. Treats Catering has been serving Cape Cod since 1985. The West Dennis Yacht Club keeps a very active social calendar throughout the year. The club has many parties planned for this summer, as well as daily lounge hours and Junior Yacht Club activities for children of members. Adult & child sailing lessons offered in the summer. Woolfie's is your breakfast bakery. Serving a large variety of huge delicious muffins, croissants, and other breakfast style pastries. We also make grilled to order breakfast sandwiches on fresh home baked bread and croissants. We do not have desserts, cakes, cookies, etc. Come early, we typically sell out and close by 1pm (ish). Due to the nature of our fresh made food, our menu will change slightly every single day. Our ingredients are sometimes available in limited quantities and are from specialty suppliers. We sincerely appreciate every single person who walks through our doors, and our mission is to make your visit special!